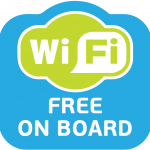 Did you know you can get FREE Wi-Fi on board the boat? Whether going to Rottnest, or enjoying a Whale Watching cruise, why not use our free Wi-Fi to check in on Facebook, rate us on Trip Advisor, or post photos online of your adventures with us! Remember, you can follow us on Facebook, Twitter and Instagram for all of the latest news and events, and subscribe to our newsletter to get them sent straight to your email inbox. If you enjoyed your trip with us, don’t forget to rate us on Trip Advisor, and tell your friends! We look forward to seeing you travel with us soon.